Patricia Grogan didn’t feel quite right. The 80-year-old grandmother was short of breath, had swollen ankles and had gained more than 10 pounds in a week — telltale signs of congestive heart failure. CHF is a dangerous condition in which the heart can’t pump blood efficiently, depriving the body of oxygen and other nutrients. That set off alarm bells for Blue Cross Blue Shield of Massachusetts nurse case manager Julie Aubin, who called Grogan last November for a routine follow-up conversation as part of her regular health plan. After hearing her patient’s symptoms, Aubin knew she needed to act fast. Aubin told Grogan to call her doctor immediately and ask about increasing her diuretic medication. 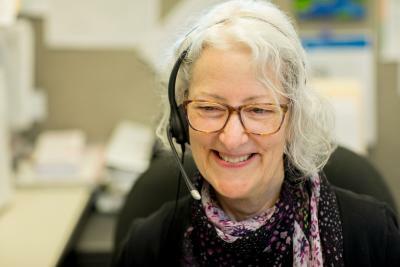 She also recommended Grogan join the telemonitoring program the health plan had recently launched for Medicare Advantage members with CHF — one of the first insurance carriers in Massachusetts to offer such a program. The telemonitoring program provides members like Grogan with simple “smart” equipment, including a scale and blood pressure cuff to use each morning. The equipment automatically sends the member’s vital signs to a visiting nurse, who monitors the numbers and can catch any potential problems early. 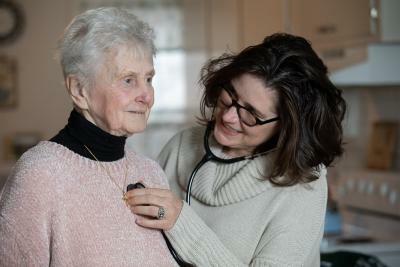 The nurse communicates and coordinates with each member’s primary care physician and cardiologist as appropriate. “With telemonitoring, you can keep people with heart failure in better shape longer, and they live longer,” said Dr. Renee Pekmezaris, vice president of community health and health services research at Northwell Health’s Feinstein Institute for Medical Research in Manhasset, N.Y., who has done extensive research on telemonitoring in heart failure patients. Her most recent study, published last fall in Health Affairs, found the rate of death by any cause for the telemonitored patients dropped by 40 percent and the rate of death specifically caused by heart failure dropped by 61 percent in the six-month period after hospital discharge. Notably, Pekmezaris also found an increase in emergency department visits in that same six-month period. She attributes that to telemonitoring’s ability to help identify problems faster, enabling patients whose condition intensifies quickly to be directed to the ED and those with less intense symptoms to be treated at home, resulting in decreased mortality. “This technology is doing exactly what it was built to do. It identifies exacerbations earlier and gets patients the care they need. You’re promptly recognizing an exacerbation, which results in decreased mortality for patients,” Pekmezaris said. Grogan’s visiting nurse, Simone Carter of the Natick Visiting Nurses Association, above with Grogan, has seen the benefit of telemonitoring firsthand: dramatically reduced visits from visiting nurses and fewer hospitalizations among her patients, helping them avoid unnecessary financial burdens, undue stress and the possibility of hospital-acquired illnesses. Within two days of Grogan joining the program, Carter installed the telemonitoring equipment in her home, and Grogan began taking her vitals every day — after making herself a cup of tea and feeding her cat. Carter also taught Grogan how to identify red flags when her condition escalated, including sudden overnight weight gain or difficulty breathing and puffy ankles, and educated her about how to better manage her condition with lifestyle changes such as eating a low-sodium diet. Four months later, Grogan agrees. Even though she is no longer in the program, she still weighs herself every morning and is trying to eat better, keep an eye on her sodium intake and monitor those telltale danger signs. She even bought herself a new scale for Christmas. “This program was a godsend for me,” she said. Pekmezaris’ study found no decrease in the rate of death after one year post-hospital discharge. She is now focused on determining how to extend the benefits of telemonitoring to more patients, and for longer than that initial six months post-hospitalization. Telemonitoring is more cost effective than other types of care, she notes, and as seniors get increasingly tech-savvy, they are more likely to adopt it. She believes the opportunity lies in using the technology to monitor patients not just after they leave the hospital but several months later when they are trying to manage their condition day to day.